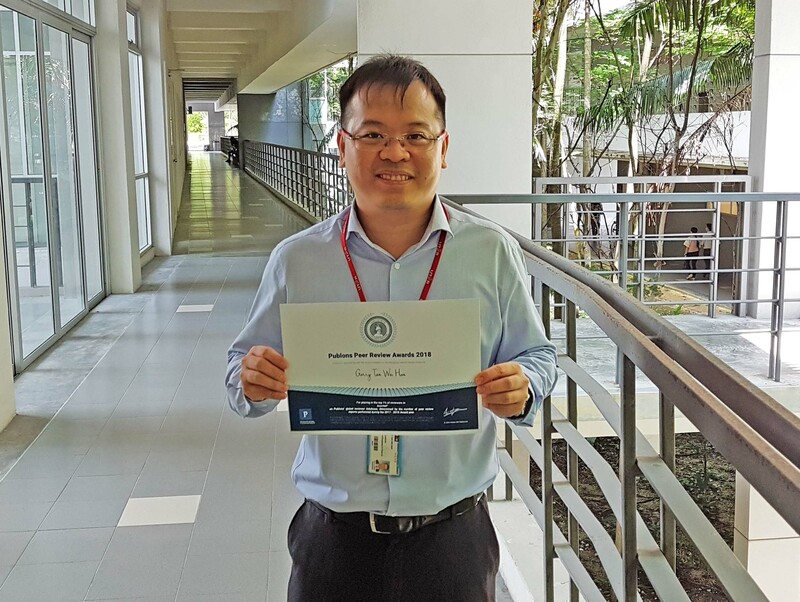 Awarded once again for his contribution to scholarly peer review and number of pre-publication reviews, Faculty of Business and Finance academic Garry Tan Wei Han was acknowledged as the “Top 1% of Reviewers” in the “Assorted” category in “Publons 2018 Global Peer Review Award”. “I am purely delighted and overwhelmed by the award, and certainly glad to be able to contribute to the reviewing process. In a review process, you need to make a recommendation for improvement on the author’s work. As such you would need to continuously read to stay updated and relevant to maintain the necessary knowledge about the subject. Indirectly this is a good process in making me a better researcher. In addition, the award also gives confidence to other journal editors as it showcases on the number of my reviews conducted over the years. Thus, this allows the editors to decide whether to engage my service as a reviewer. This benefits me in terms of professional development,” enthused Tan. Rankings are calculated by the number of verified pre-publication reviews performed and added to Publons between 1 September 2017 and 1 September 2018. Reviews were attributed to an ESI field based on the journal the review was performed for. A 23rd field, “Assorted” was recently added to celebrate reviewers whose contributions were for the small number of journals on Publons that could not be directly matched to an ESI field. The ESI field categorisation was used due to the broad research areas that align with the Web of Science — the most trusted citation index for scientific and scholarly research. Tan has reviewed about 70 articles over the last one year. Among some of the recent and renowned journals indexed with Clarivate Analytics (formally Thomson Reuters) include Expert System with Applications (Elsevier; ISI; SSCI), Telematics and Informatics (Elsevier; ISI; SSCI), Information and Management (Elsevier; ISI; SSCI), Online Information Review (Emerald; ISI; SSCI), Journal of Cleaner Production (Elsevier; ISI; SCIE), Computers in Human Behaviour (Elsevier; ISI; SSCI), Information Technology for Development (Taylor and Francis; ISI; SSCI), International Journal of Contemporary Hospitality Management (Emerald; ISI; SSCI), Management Decision (Emerald; ISI; SSCI), International Journal of Finance and Economics (Wiley; ISI; SSCI), Complexity (Hindawi; ISI; SCIE), Applied Economics Letter (Taylor and Francis; ISI; SSCI), Internet Research (Emerald; ISI; SSCI), Asia Pacific Journal of Marketing and Logistics (Emerald; ISI; SCIE), International Journal of Bank Marketing (Emerald; ISI; SSCI), Emerging Markets Finance and Trade (Taylor and Francis; ISI; SSCI), IEEE Access (IEEE.org; ISI; SCIE), New Review of Hypermedia and Multimedia (Taylor and Francis; ISI; SCIE), and The Service Industries Journal (Taylor and Francis; ISI; SSCI). Apart from Tan, more than 6,000 other reviewers were also awarded by Publons, with reviewers coming from more than 2,000 institutions from various countries. 230,000 reviews for 10,000 different journals were completed and covered diverse subject fields ranging from astrophysics to tourism. Publons was founded by Andrew Preston and Daniel Johnston in 2012 to address the static state of peer-reviewing practices in scholarly communication, with a view to encourage collaboration and speed up scientific development. The Publons name is an homage to the “publon”, the "minimum unit of publishable material". Publons was acquired in 2017 by Clarivate Analytics — the global leader in trusted insights and analytics that accelerate the pace of innovation. The company is registered in New Zealand and has an office in London, UK.